This article explains the Five Forms of Power, developed by John French and Bertram Raven in a practical way. After reading you will understand the basics of this powerful leadership theory. Social psychologists John R. P. French and Bertram H. Raven conducted a remarkable study about power in 1959. They stated that power is divided into five separate and different forms. As we know, power and leadership are closely linked. This Five Forms of Power concept shows how the different forms of power affect a person’s leadership and success. The Five Forms of Power concept is often used in an organization-wide communication. The French-Raven’s five forms of power are introduced with observance of the level of observability, and the extent to which the power is dependent on structural conditions. Dependency refers to the degree of internalization that occurs among individuals subject to social control. On the basis of these considerations, it is possible to link personal processes to structural conditions. What are the Five Forms of Power? This form of power is based upon the idea of coercion. This means that someone is forced to do something against their will. The main objective of coercion is compliance. This form of power illustrates what happens when compliance is not obtained. 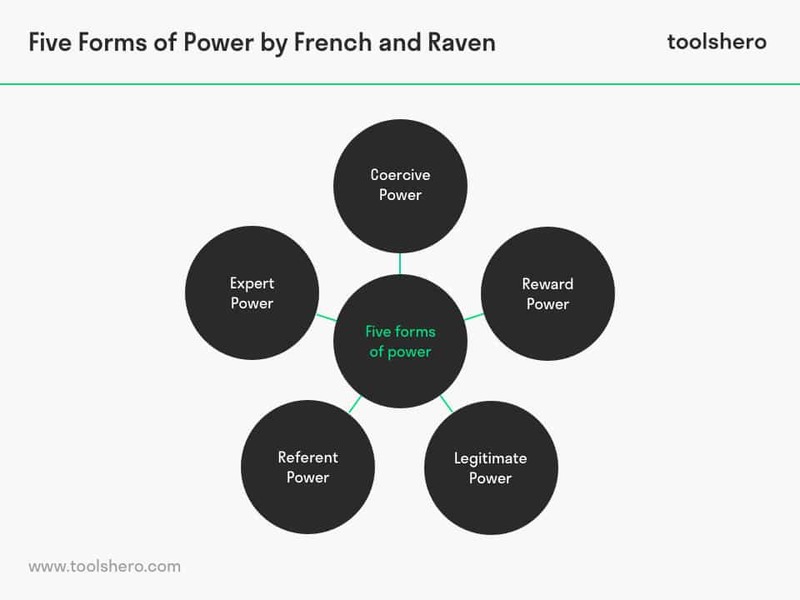 According to French en Raven there are also other forms of power that can be used in a coercive manner such as withholding rewards or expertise or using referent power to threaten social exclusion. The force of power is also associated positively with punitive behaviour and negatively associated with conditional reward behaviour. This form of power often leads to problems. In many cases this form of power is abused. Coercive power can lead to unhealthy behaviour and dissatisfaction at work. Leaders who use this leadership style rely on threats in their management styles. Often these threats relate to dismissal or demotion. This type of power involves the ability of individuals to delegate matters they do not wish to do to other people and to reward them for this. For managers in an organization it is a perceived possibility to value or reward their subordinates’ good results in a positive manner. This form of power is based on the idea that as a society we are more inclined to do things well when we are getting something in return for this. The most popular forms are raises, promotions or compliments. The problem with this form of power is that when the reward does not have enough perceived value to others, the power is weakened. One of the frustrations when using rewards is that they often need to be bigger than the last time if they are to have the same effect. Even then, when they are given regularly, employees can become satiated by the rewards and as a result, they will lose their effectiveness. This form of power gives the ability to link certain feelings of obligation or notion of responsibility to the management. Rewarding and punishing employees can be seen as a legitimate part of the formal or appointed leadership role. Most managers in organizations execute a certain degree of reward and punishment. Legitimate power is usually based on a role. People always run with the pack and traditionally obey the one person with power which is solely based on their position or title. This form of power can easily be overcome as soon as someone loses their position or title. This power is a weak form to persuade and convince other people. This form of power is about management based on the ability to administer to someone a sense of personal acceptance or approval. The leader in this form of power is often seen as a role model. Their power is often treated with admiration or charm. This power emanates from a person that is highly liked and people identify strongly with them in some way. A leader who has referent power often has a good appreciation of their environment and therefore tends to have a lot of influence. Responsibility in this form of power is heavy and one can easily lose oneself in this. In combination with other forms of power, it can be very useful. Celebrities often have this form of power in society, but also lose a lot of power because of certain circumstances. This form of power is based on in-depth information, knowledge or expertise. These leaders are often highly intelligent and they trust in their power to fulfil several organizational roles and responsibilities. This ability enables them to combine the power of reward in the right mode. The fact is that if someone has a particular expertise within an organization, they can often persuade employees, who trust and respect them, to do things for them. This expertise is greatly appreciated and forms the basis of this type of leadership. What do you think? Do you recognize the Five Forms of Power? Are these forms of power applicable in practice or are there additions? What are in your opinion success factors for the good leadership? Raven, B. H. (1992). A power / interaction model of interpersonal influence: French and Raven thirty years later. Journal of Social Behavior and Personality. Raven, B. H. (1964). Social influence and power. CALIFORNIA UNIV LOS ANGELES. Raven, B. H. & French, J. (1959). The bases of social power. InD. Cartwright(Ed. ), Studies in social power(pp. 150-167). Ann Arbor, MI: Institute for Social Research. Raven, B. H. & Rubin, J. Z. (1976). Social psychology: People in groups. John Wiley and Sons. Now, I am learning about Leadership style and power. It’s very useful for me. Anyway thanks. Thank you for your comment, Mitchell Susan Maung.